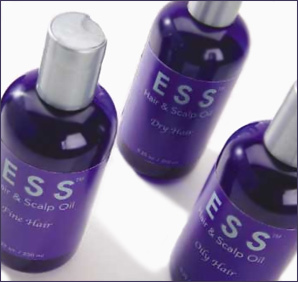 Balance and treat the hair and scalp with essential oils for dry, oily, fine, or any type of hair. Pamper your hair and scalp with this deep conditioning aromatherapeutic treatment. To begin, warm the selected oil and massage into the hair and scalp, working it thoroughly from the scalp to the ends of the hair for a truly nourishing replenishing therapy. Cover the hair with a towel, turban or shower cap (recommended to use a plastic or disposable shower cap as it will not stain like material) for about 10 minutes. Then wash with a mild shampoo. A replenishing aromatherapy blend for dry, irritated hair. Cedarwood and Chamomile soothe the scalp, while Lavender aids in the repair of the scalp and hair. Bergamot, Clary Sage and Melissa add an uplifting, fresh note to the blend that acts as an overall tonic. Size: 8 oz. An astringent aromatherapy blend for oily hair and scalp. Lemon, Bergamot and Lemon-grass are deep cleansing and aid in detoxification. Geranium and Cedarwood help to balance the overproduction of oil. Spearmint is refreshing and uplifting, with a hint of Cypress to purify the scalp. Size: 8 oz. A rich conditioning aromatherapy blend using the powerful properties of essential oils, such as Ylang Ylang, Sandalwood, Lime, Petitgrain, and Clary Sage. Size: 8 oz. A delicate aromatherapy blend for fine, thinning hair and hair loss. Combines Bay, Rosemary, Eucalyptus, Lemon, Basil and Clove to stimulate circulation the hair root and strengthen the growth of new hair. Size: 8 oz.